It's that time of the year again. Chuseok, Korea's Traditional Thanksgiving Day, is coming soon and Delica-Hans, Lotte Hotel, as well as, Delicatessan &Sidewalk Cafe have a special treat for you. 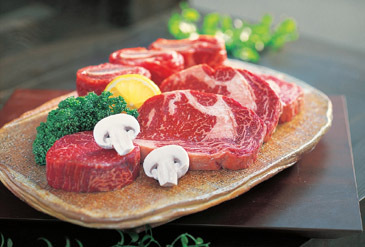 They are offering Deluxe Beef Gift Sets priced from 200,000won - 500,000won; Dried Yellow Corvina Sets 220,000won - 380,000won; Honey & Tea Sets at 30,000won. The Natural Abalone Sets and Pine Mushroom Sets are priced at market value. Of course, the Hamper Baskets are the most special prize of all, including your choice of selected wines, herbal teas, coffees, honey, chocolates and more. For you wine lovers Lotte Hotel Seoul's VINE Restaurant, Wine Bar & Shop provides specially created gifts by VINE's renowned sommeliers. All of you know about BYOB but now you can celebrate BYO wine every Saturday at VINE, Lotte Hotel Seoul's wine restaurant. All customers have the privilege to bring their own wines without corkage charge. The service limited to retaurant patrons with a limit of three wine glasses per person, and three different decanters per party. Here is a special service designed to help all of you wine lovers to enjoy wine from their collections while enjoying fine dining at VINE. This does not extend to wine bar patrons. Nevertheless, you gain wisdom from VINE's lady chef, Robyn Cooper through her vast knowledge of wine and food, bringing authentic, seasonally inspired wine-centered dishes: light and delicate in flavor prepared frm only the finest, freshest for patrons to savor. VINE is located on the Lobby level of the Lotte Hotel Seoul. This is a place for one and all - from novice to afficanado or connoisseur where they can pursue their appreciation for fine wine. VINE is a place to enjoy fine wine and learn more about it. In case you're wondering, VINE is a modern but convivial bistro style wine bar and restaurant serving food and beverage with a seating capacity of 134. 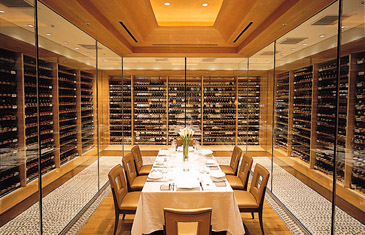 It's an intimate environment with a focus on harmony between food and wine.